In Create a treeview from json we looked at how to load up a treeview with a cJobject. One of the examples loaded up the Rest to Excel library to a treeview. Taking it one stage further, what if we executed the rest queries right there, in the excel form, and loaded the results into a treeview - well here it is. Note: I've had to suspend this one from the downloadable worksheet because windows 7 service pack 1 and windows 8 seem to have destroyed the treeview control required for this function. I'll reinstate once I find a suitable alternate control to use. These are enhancements to Data Manipulation Classes so they have been included in cDataSet.xlsm, which is downloadable from Download Complete Projects. You can find the test tab, restLibraryForm, and run this right away. On bringing up the form, you will see the rest Library contents. Select a library entry. To add new entries to the library, see Adding to the rest library. Alternatively you can enter a URL directly into the the Query URL text box. Enter some Query Text. 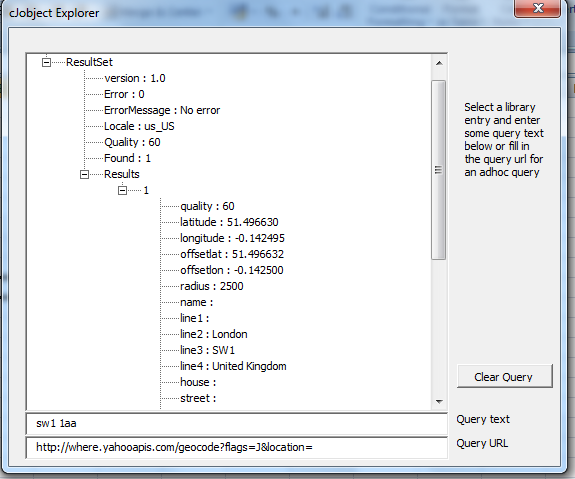 In this case we are going to use Yahoo geocode library entry to geocode against a UK postcode. Clear Query to get back to the Rest Library. I already covered in Create a treeview from json the simplicity of creating a treeview from a cJobject. Rather nicely, the Rest library class cRest. 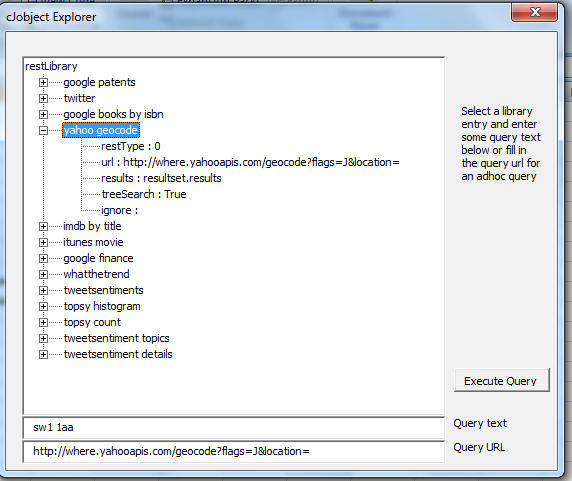 also returns a cJobject containing the results of its query, so using the cJobject.toTreeView() method, we can use exactly the same technique to populate the treeview as we did the library. See How to traverse a treeview and Getting started with recursion for a gentle introduction into the recursion technique used here. Why not join our forum,follow the blog or follow me on twitter to ensure you get updates when they are available. Now see more about Rest to Excel library.